Here’s Frank Caliendo at his best with a parade of characters helping him mock the over-the-top Richard Sherman coverage. 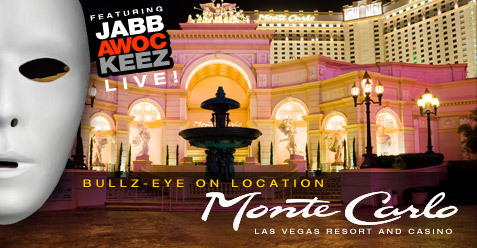 We had the opportunity to visit the Monte Carlo Resort and Casino in Las Vegas to check out the new show from the world famous dance crew Jabbawockeez. Jabbawockeez generated some great buzz with shows earlier this year, so we were excited to see them at their new home at the Monte Carlo for the premiere of “MÜS.I.C.” Life was good as we spent some "behind the scenes" time with the crew, attended the incredible premiere and enjoyed the comforts of the Monte Carlo. The Monte Carlo Resort and Casino is located right in the heart of the Vegas Strip, and this premium location is now even better with the connection to the spanking new City Center/Aria Resort. We were impressed as the staff seemed to be very serious about making the Monte Carlo a major player in the Las Vegas entertainment scene and making the hotel an “all needs under one roof” resort. We were fortunate to spend our few nights at the Monte Carlo in a Monaco Suite that was well equipped with 700 square feet of luxurious space including a king size bed, one and a half baths, stylish furniture, 32" HDTV flat-panel TV, mini-fridge built into the entertainment center and a staff that was a phone call away 24/7 with excellent service. Dining at the Monte Carlo was also a big hit with our group. On the first night we ate at Brand Steakhouse, which combined the feeling of a classic steakhouse with an open view of the casino for some fun people watching. I ordered the Rib Eye cooked medium and I enjoyed every bite as I downed my dirty vodka martini. There is also a very exclusive part of Monte Carlo that most don't get a chance to see. The new Hotel32 is discreetly located on the 32nd floor with elevators that you barely notice next to the main elevators. Hotel32 is for VIP guests who enjoy the finer things in life and expect to travel in style and comfort. Guests are treated to incredible penthouse suites that are so comfortable and catered that you never have to leave. The Hotel32 staff is ready to take care of your every need, with full concierge and butler service, preferred reservations at MGM Mirage restaurants and shows, and so much more. The coolest feature has to be the red iPod Touch that is loaned to guests when they arrive so that they can easily communicate all their needs and desires to the staff through a cool app. After checking out all that the Monte Carlo and Hotel32 have to offer, we were ready for the Jabbawockeez premier. Media bloggers had a chance to spend time with the cast on Thursday night, and I found the dancers to be some of the most grateful and enthusiastic performers I had met through the years. These young men are full of positive energy and are symbolic of what hard work and perseverance can deliver for those who are dedicated to their craft. The Jabbawockeez cast is very talented, but their story is even more impressive. They started dancing in each other’s garages in California dating back to the late ‘90s and were crowned champions of "America’s Best Dance Crew," and now they’re starring at the Monte Carlo on the Las Vegas Strip. The energy and buzz reached a fevered pitch by Friday night at the pre-party at the hip Ignite Lounge, which is right across from the Monte Carlo theatre where Jabbawockeez will begin their run in Vegas. One of the better looking crowds in town brought their own excitement to the pre-launch party that extended outdoors at the footsteps of Las Vegas Blvd. with beats from the show pumping and video playing on a wall between columns that set the stage for the evening. We were then ushered in to excellent seats and enjoyed heart throbbing music to some of the funkiest and well choreographed breaking and popping one could imagine! The performance kept me riveted and I really enjoyed the stories told through dance and dynamic teamwork the Jabbawockeez displayed through some very difficult stunts. There is also a certain mystery that surrounds the show as all cast members wear the same white mask. The performance leaves you with the illusion that the expressions change on the faces of the masks. The Jabbawockeez team sinks or swims with each other as they are nameless and faceless until the show is complete. Whether you are a hip hop fan or just someone who enjoys a great show, Jabbawockeez MÜS.I.C. will entertain and amaze you and have you feeling energized for more Monte Carlo fun! I also found it very clever how the production team even included unexpected music from eras back to Grace Kelly’s “Singin’ in the Rain” along with more surprises you need to experience for yourself. At the post-party the cast joined their supporters and knew they hit one out of the park as everyone had smiles from ear to ear. There were some notables at this party, as super comedian, impressionist and Monte Carlo headliner Frank Caliendo made an appearance and posed for some photographs. The young and energetic crowd both in the theater and at the party made this night at the Monte Carlo one of the hottest spots in Vegas. If Jabbawockeez continues to nail it like they did at their grand opening, the Monte Carlo will be jumping for Jabbawockeez for years to come! Tags: cool apps, Frank Caliendo, fun apps, Hotel32, Jabbawockeez, Las Vegas, Las Vegas hotels, Las Vegas shows, Monaco Suite, Monte Carlo, Monte Carlo Casino, MÜS.I.C.